Watching first-person footage of racing drones makes it seem like the tiny craft fly somewhere close to the speed of light. In reality, due to the limits of their human pilots, they top at around 80 miles per hour. That’s incredibly fast, but the Drone Racing League managed to double that with a new world record speed of 163.5 miles per hour. To ensure its races are decided by the skills of the pilots, and not the amount of funding and pricey hardware each team can secure, the competitors in the Drone Racing League all fly the same quadcopter, designed by the league’s own team of engineers. Pushing the technology that goes into the DRL’s Racer3 to its limits, those same engineers recently designed and built a high-performance racing craft called the DRL RacerX. Weighing just 800 grams (1.7 pounds), the RacerX is powered by a pair of 1,300 mAh batteries and four electric motors that can each hit speeds of up to 46,000 RPMs. That’s an incredible amount of performance to squeeze out of a tiny electric motor. According to an email the team sent us, one of the prototypes burst into flames after hitting its highest point of acceleration. 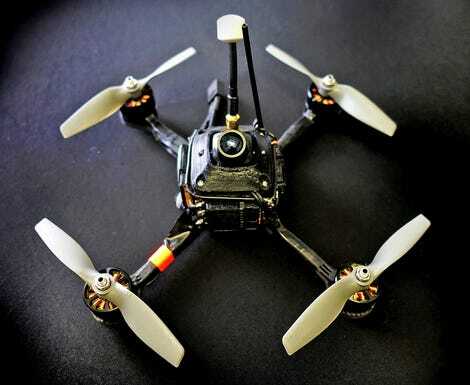 The drone’s top speed is actually 179.6 miles per hour, but in order to be officially recognised by the Guinness World Records for the fastest ground speed achieved by a battery-powered remote-controlled quadcopter, the DRL Racer X had to fly back and forth across a 328-foot long course, with the top speeds of both runs averaged together. The official result of that completed run was 163.5 miles per hour. That not only bests the previous official world record of 125 miles per hour, but also unofficial, one-way top speed records posted to YouTube, including this one of a drone supposedly hitting 145 miles per hour. That means the RacerX is even faster than Ford Mustangs and Chevrolet Camaros, and it can easily destroy your four-door family sedan in a drag race. Keeping an eye on those troublesome emmets.